Vancouver cruise deals are available no matter if your dream cruise takes you north to points in Alaska or south to the Pacific where the islands of Hawaii are beckoning. Mountains and glaciers or volcanoes and beautiful beaches, when you get a great deal it just makes any vacation that much more enjoyable. Here are the best cheap cruises from Vancouver, sure to make anyone smile. 1. Holland America holds one of the best Alaska cruises from Vancouver, with their 7 night roundtrip that takes you to the breathtaking Twin Sawyer Glaciers, Juneau, Skagway, Glacier Bay National Park and Ketchikan. Their May 1st 2013 sailing is on sale now for $499 per person, saving you 71%. 2. Vancouver cruise deals from Norwegian bring you freestyle cruising at its finest, and their May 12th, 2013 cruise is now on sale from just $479 per person, a 69% savings. This cruise takes you to Juneau, Skagway Ketchikan, Glacier Bay National Park and Victoria before it hits the end port of Seattle 7 nights later. 3. Alaska cruise deals courtesy of Princess Cruises are on sale, now starting at just $452 per person, a savings of 74%. This 7 night trip that commences on May 13th, 2013 takes you to Ketchikan, Juneau, Skagway, Glacier Bay National Park and College Fjord in this one way trip that ends in Whittier. 4. If a roundtrip cruise from Vancouver to Hawaii is on the agenda, check out the Holland America offering, leaving on April 18th, which is just one of the phenomenal Vancouver cruise deals to be had. This 17 night cruise takes you to Honolulu, Maui, Hawaii, Kauai and Victoria, BC on the way home. Starting at just $1799, a savings of 44% off, this one can’t be missed! 5. A Royal Caribbean Alaska cruise like the one departing on June 14th for 7 nights is a great getaway to the vast state to the north. This trip starts at just $769 per person and takes you through the Inside Passage, to Ketchikan, through Icy Strait Point, to Juneau, Skagway, the Hubbard Glacier and then on to the end port of Seward. The port of Vancouver is a welcoming departure port for many cruise lines and millions of passengers each and every year. It is picturesque and friendly, giving cruise passengers stunning views from the moment they arrive in town. The city itself offers major sports teams, many points of interest, fine dining opportunities and of course a multitude of hotels and activities to please everyone in your party. 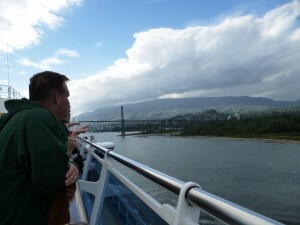 Vancouver cruise deals just make this port a better choice for many whether you are traveling from other cities in Canada or the western United States.